Within the first few moments of Michael Powell and Emeric Pressburger's A Matter of Life and Death, Peter Carter (David Niven) and Jane (Kim Hunter) meet for the first time. Not exactly in the most conventional way though; she's a radio operator who chats with him before he jumps out of his plane without a parachute. That should have be their only meeting. But miraculously, Peter survives. The two eventually meet and a love affair blooms. However, as it turns out, Peter was supposed to have died, and those in "the Other World" aren't too pleased at the screw-up. Admittedly this is a very different film compared to some of Powell and Pressburger's later films. Where Black Narcissus and The Red Shoes revolved around women trying to balance their devoted professions with their ever-growing complicated lives, A Matter of Life and Death is more about, well, life and death. Sounds simple, yes, but it's really not, especially with a love story tied in as well. 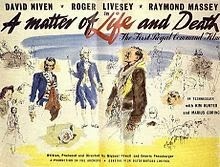 A Matter of Life and Death, although not my favorite Powell and Pressburger film, is actually quite lovely. For a film revolving around heaven and earth, it doesn't get overly philosophical. (Not that I'm complaining.) It's certainly a film to seek out.